Preheat the oven to 200 degrees. Take the beef out of the refrigerator and bring to room temperature, which could take u1 hour or more. Slice compound butter into rounds and lather on beef together with a generous amount of salt. Once you have taken out the beef, place the pan along with the pan juices on the stove top and add ½ cup port and reduce by 1/3. Add beef stock and reduce by another 1/3. Add flour while stirring and bring back to the boil. Strain and season to taste with salt and pepper. 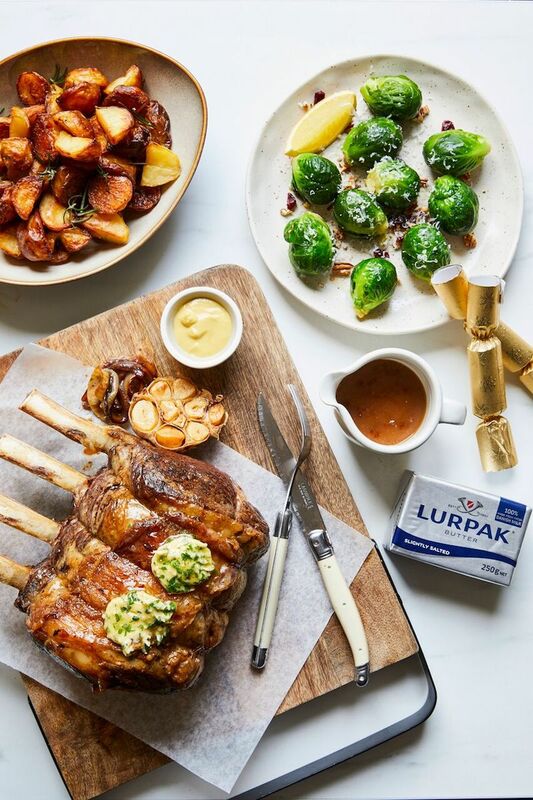 To cook the brussel sprouts, add Lurpak butter into a pan and begin to cook on medium heat until milk solids begin to caramelise. Add brussel sprouts and toss, season with salt, pepper and smoked paprika and finish with lemon juice, cranberries and pecans. Fit an electric mixer with the paddle attachment, sift and add all dry ingredients. In a larger measuring jug gently whisk together all remaining ingredients and add wet mixture to dry ingredients and mix on medium for 2 minutes. Pour into prepared pan, batter will be a liquid consistency. Bake got 40 minutes or until a toothpick or skewer comes out almost clean. Cool on a wire rack for 10 minutes. Loosen edges with a small palette knife and gently invert onto rack until completely cool. For the frosting, whip butter for 8 minutes on medium speed in the electric mixer with the paddle attachment. Butter will become pale and creamy. Add remaining ingredients and mix on low for 1 minute, then on medium for 6 minutes. Frosting will be very light, creamy and fluffy. 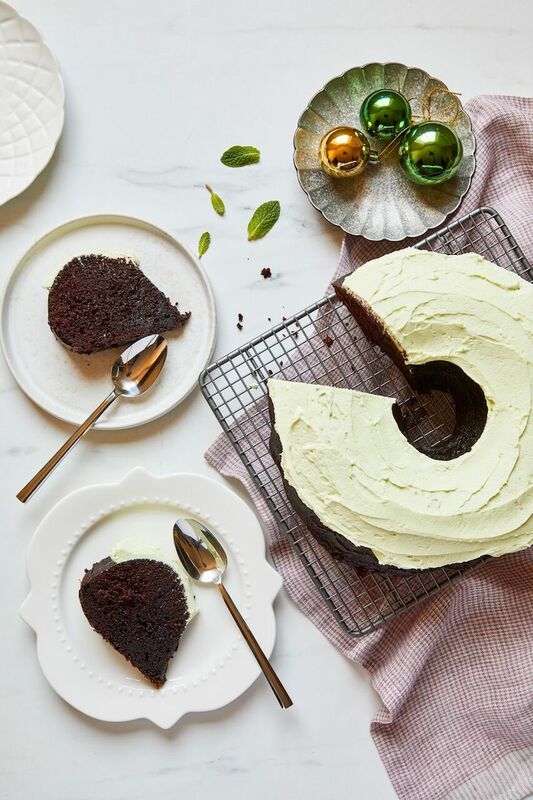 Take your wreath cake and slowly spread the icing on the top of the cake. If you like extra peppermint completely coat the outside of the cake. mindfulness: WHAT IS THE PURPOSE OF LIFE?